The Golden Temple is the ultimate Sikh pilgrimage. The Harmandir Sahib, as it is traditionally known, actually means the temple of Hari or the Supreme God. 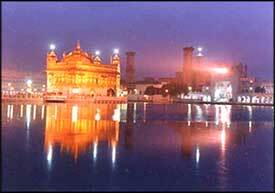 Also known as the Darbar Sahib, the stupendous, architectural phenomena is located at the city of Amritsar. The temple's exterior is gold-plated and the structure stands in the middle of a square tank. There is a causeway across the Pool of Nectar to reach the Temple. 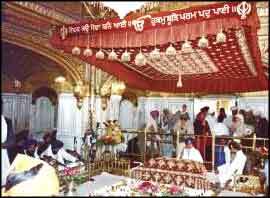 The shrine is symbolical of the doctrines of Sikhism. It also represents the magnificent strength of all the Sikhs. The amazing thing about Harmandir Sahib is that it has doorways on all four sides, meant to be open for the people of the all four castes. All over the, the Sikhs always look forward to visit to the magnificent temple and offer prayers at the Harmandir Sahib. Amrit Vela means the pre-dawn moment. It is actually the time when the watch strikes four o'clock in the morning. The pilgrims wake up and start preparing for a serene early morning visit to the Darbar Saheb. After reaching the temple entrance, one must take off their shoes at the 'shoes counter'. The next step is to dip one's feet at a channel of running water. On the way to the temple, there are lined up flower stalls, for one to buy garlands or just fresh flowers for offering. The sublime shrine is reached by descending a flight of marble stairs. The idea is to teach humility to mankind. The staircase leads to the parkarma, where is situated the inspirational and awesome Harmandir Saheb, in the center of the Sarowar. Naturally, one is inclined to bow down to touch the cool marble with their foreheads. Then of course, one goes left to go around the entire parkarma and stop at shrines on the way, before making it finally to the Harmandir. It is the very first shrine on the Parikrama way. Known as Dukh Bhanjani Ber, it is actually built around a jujube tree. The relevance of this spot lies in its story which says that, a dip in the sacred pool inexplicably cured a crippled youth. Devotees believe that their visit to the temple remains incomplete without bathing at this spot. So, it has become a custom to stop and bath here for any kind of healing. Next is the stop for a raised marble platform, known as the Ath Sath Tirath. It is believed that bathing near it fulfils one's wish of visiting the 68 holy places of India. The next corner has the shrine of Baba Deep Singh, the legendary old warrior who died at this spot. The names of Sikh martyrs who died in the war are inscribed on marble tablets set in the floor of the parkarma or on the pillars of the verandahs. 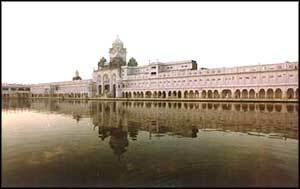 The Akal takht and the Darshani Deorhi are the very next destination for the eager devotees. The ceremony of bringing down the Guru Granth Sahibcommences half an hour prior. For the occasion, the palki, a gold and silver palanquin, are prepared for it. Attendants lay down fresh sets of silk and brocade coverings and sprinkle rose water. The head priest of the Harmandir appears with the Sri Guru Granth Sahib on a cushion on his head. And to mark the occasion and to alert the worshippers, there starts the drumbeat sound of the Nigara. 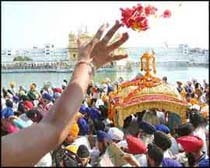 The procession solemnly moves across the plaza, through the Darshani Deorhi, and along the causeway, stopping as it reaches the main door of the Harmandir. The head priest reverently lifts the Siri Guru Granth sahib out of the Palki, places it on a silk cushion on his head, and enters the holy shrine. The Head Priest carries it to its Place of Honor, which is a place below the velvet canopy, richly brocaded in silver and gold. He then sets it on velvet cushions and silks placed on a manji sahib. Then the head priest sits in front of the Holy Book and reads it aloud the Vaaq ( the Lord's message ) to the Sangat (congregation) standing. At the end of it, it is time for the entire Sangat and the sewadars to stand up for the Ardas, a prayer. Following which takes place the shabad kirtan, the song of the sacred verses. The Har ki Pauri is the place to be visited after the Ardas prayer. It is on the southern side of the inner parkarma. There is a marble staircase leading into the sarowar. Visitors stop here to sprinkle water from this sacred pool into their heads. One can drink a little bit of water for its remedial power also. Continuing on the inner parkarma, the devotees again bow towards the Guru Granth Sahib. Then they make way back over the causeway, through the Darshani Deorhi and onto the main parkarma. At this stage, one would see the Ber Baba Buddha or the Tree Shrine. Baba Buddha was the first head priest of the Harmandir Sahib. The evening is a time for the devotees to come and listen in deep thoughtfulness to the evening recitations. It is time for the Rahras, the Arti and the shabad kirtan. At end of the prayers, the Sri Guru Granth Saheb is reverentially and royally carried to the palki waiting outside. The palki is carried by dedicated Sikhs. The grand Darshani Deorhi is shut down for the visitors after this.